The schedules for our Hunter Trial, Senior One Day Event and Mini One Day Events are now both available online. 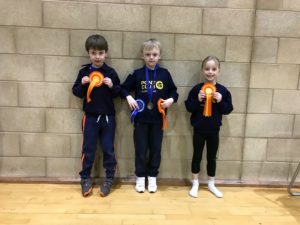 Some of the younger members have been participating in the winter Triathlon competitions that are organised by many branches, and have enjoyed early success. Here are Seb Stewart, Oliver Hicks and Jess Eliot after the Beaufort Tri on 10th February, where the team were placed 7th, and Oliver Hicks won his individual section and had Best Swim. An introductory rally will be held over the Easter holidays. All members welcome. Older members can volunteer to help at mini camp (29th July to 1st August) and junior camp (5th August to 9th August) and count this towards their DoE Volunteering requirement. Your membership of the Pony Club will expire on 31st January 2019 and must be renewed if you wish to continue to take part in any rally or clinic. For members interested in representing their branch at any 2019 Area Competitions you must have re-joined by no later than 28th February 2019. Mrs Joanna Lee, Lodge Farm, Greens Norton Road, Towcester, Northants, NN12 8AW. Thank You to everyone who came to our Parents Evening, to share our latest news and discuss ideas. During the evening we thanked Jenny Jackson-Stops who stepped down as President of the Branch after many years, and welcomed Maureen Wyman who has taken over the role. Maureen’s first task as president was to award the Rosie Stewart salver. Rosie Stewart was a Grafton member and a promising young rider with the potential to reach a very high level, she was sadly killed in a car accident in 2007. This salver is awarded in her memory to a Grafton member who is achieving at a high level in the equestrian field, and this year has been awarded to Ellie Binns. 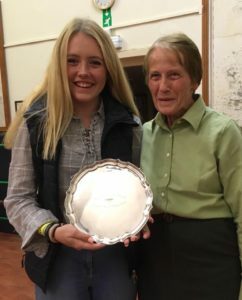 Ellie represented England in the British Eventing Under 18 Development Squad at the Nations Cup in Millstreet, Ireland in August, competing in the FEI 1* competition. Ellie finished a fantastic 7th out of 64 competitors, was the 2nd placed British rider, and the youngest by 2 years. Ellie is now aiming for the Junior squad, and shows both the ability and dedication to succeed. We look forward to following Ellie’s career over the coming years. After more than five years Amanda Smith has decided to stand down from her role as GHPC team training coordinator. Amanda has done a brilliant job of organizing all of us and we are very grateful indeed. Katherine Lewis has agreed to take over the role with immediate effect. She will try to run the admin side of things as efficiently as Amanda. A big well done and thank you to all those of you who represented the Grafton in the Area competitions this Summer there were some outstanding performances with Grafton members riding at all levels at The Championships at Cholmondeley Castle and The Regional Championships at Keysoe. Let’s see if we can do it again next year! Badge and test training will commence on Tuesday 18th Sept 2018 at Plum Park Farm and continue every other Tuesday for the rest of this term .